Let’s take a look at a project we helped out with here in our hometown of Fort Wayne, Indiana. First though, I’ll give you little background on the amazing neighborhood this house is located in. Just to the west of our downtown you’ll find the West Central Neighborhood. Around the 1830s downtown workers started building small homes in the area. As the city grew these homes were torn down and replaced with luxury homes owned by some of the city’s most prominent citizens. From pretty Queen Anne Victorians to stately Greek Revivals, you can find a little bit of every architectural style in West Central. From the 1950s through to the 1980s many of the homes fell into disrepair and many were split into multiple apartments (unfortunately an all too common story). However, since the 1990s the neighborhood has seen an amazing revitalization and has again become a place of pride in our city. 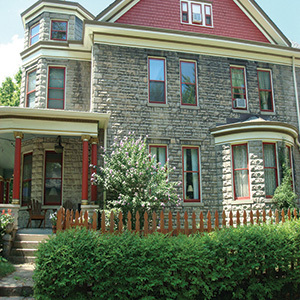 In 2010, This Old House named it one of the Best Old House Neighborhoods in the Midwest! So on to our project. Several homes in the West Central Neighborhood were built entirely out of rock face (rusticated) concrete block. One of the homes was in need of some replacements for some damaged block along the front steps. 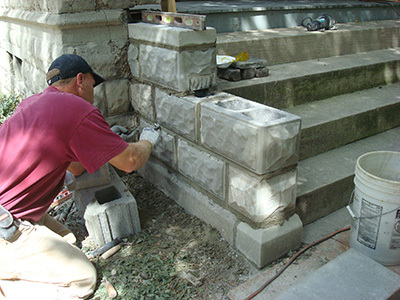 Working with one of the city’s top masons, we were able to replace the crumbling block with exact replicas of the originals. As you can see the stair walls carried on the design of the house’s foundation with a solid footer, three rows of block and then a string course. The workers first removed the old, crumbling block. New footers were laid and the new blocks were installed. Some cuts were required and one block was replaced along the porch wall. The block was then stained a light gray to cover up any color variations. This was a quick and fairly easy project that really improved the look of this house while maintaining the historic design integrity.